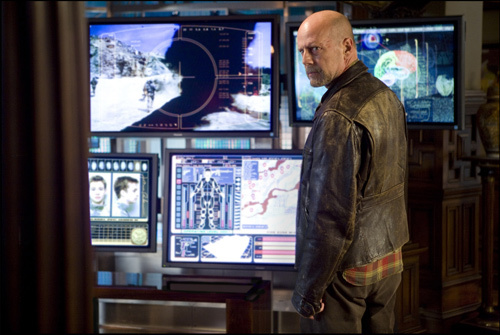 The first official image of Bruce Willis in the film adaptation of the sci-fi graphic novel ‘The Surrogates’. FBI agents (Bruce Willis and Radha Mitchell) investigate the mysterious murder of a college student linked to the man who helped create a high-tech surrogate phenomenon that allows people to purchase unflawed robotic versions of themselves – fit, good looking remotely controlled machines that ultimately assume their life roles – enabling people to experience life vicariously from the comfort and safety of their own homes. The murder spawns a quest for answers: in a world of masks, who’s real and who can you trust? The film stars Bruce Willis, Ned Vaughn, Radha Mitchell, Ving Rhames and Rosamund Pike. Release date September 25th, 2009.